If you’re looking for a powerful, durable and safe commercial pizza oven that delivers to the UK, then you’re in luck – we may have found you just the thing. 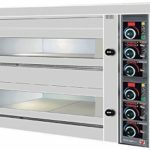 Made in Greece by leaders of the field North Pro Gas, this Commercial Electric Twin Deck Pizza Oven is perfect for all of your commercial pizza baking needs, whether you’re a small food outlet or part of a larger chain of eateries. 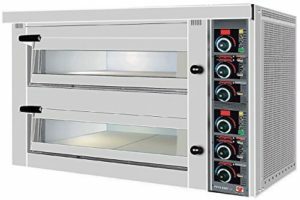 This robust commercial pizza oven comes brand new with a one-year warranty (parts only) and the ability to connect to all European power points, including those in the UK. You will need to hire a qualified electrician to do the electrical installation for you, as it does not come installation-ready – as noted in the oven instruction manual. This oven operates with 400V-3N-AC-50Hz. Designed to rest on a table or countertop, this electric twin deck commercial pizza oven comes with a high quality fire-resistant plate, so you can feel secure that the oven is safe and fireproof. With dimensions of 152 x 95 x 80 cm and a boxed weight of 580 kg, this is a relatively large and bulky commercial pizza oven that is made for heavy-duty cooking. Its stainless steel construction makes for improved hygiene and easy cleaning, ideal for closing down at the end of the night. The insulated glass doors of this North Pro commercial pizza oven help to retain heat and reduce energy consumption, while still allowing the chef to keep a close eye on the pizzas as they bake – also helped by the halogen lighting. For ease of use, the doors have ergonomic handles that make it quick to dish pizzas in and out. For the organised chef, the preheating switch helps to get things warmed up before customers start arriving. The ideal cooking temperature is easily monitored, thanks to the digital thermometer and in-built thermostatic sensor. For your money, we think this is one of the best quality electric pizza ovens you can get your hands on. North Pro Gas is a renowned manufacturer of commercial catering equipment – so you know you’re in good hands. Depending on your needs, they have a range of alternative pizza ovens available, so be sure to browse their full range to kit out your perfect pizzeria.